Your flat single custom cushion covers are made from luxury Soft Velvet and are a dream to touch. You can print both sides with your original designs, or choose from 5 backing colours for the reverse; baby blue, soft pink, cream, white or grey. 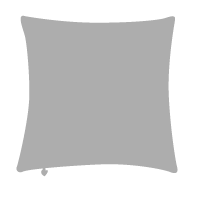 They are available in 3 sizes so you can match them with your existing cushion pads. Printed edge-to-edge with your original images, design your own cushion slips to replace tired cushions around the home, or spruce up your establishment with colour, creativity and personality. Design your own cushion slips and give your existing cushion pads a makeover. Available in 3 sizes, you can easily refurbish your entire cushion collection without disposing of what you've already got. Machine washable, they come with either a standard or heart shaped zipper to remove the wadding inside. The luxury soft velvet is smooth, warm and cuddly cushion material, and the print finish is exceptional. To get 2 cushions in one, these printed cushion covers come with an option to design the other side, or simply choose from baby blue, soft pink, cream, white or grey for the reverse colour. Important: Please make sure you measure your existing pads and check they are fire rated before you order custom cushion covers. Pads must be compliant and will say so on the label. 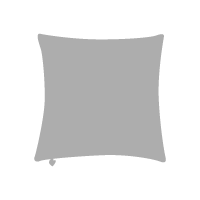 We have 3 cushion cover sizes that fit most standard size cushion pads. This includes 2 square covers and one rectangle. Your designs are digitally printed onto our gorgeous Soft Velvet fabric, cut to your selected size and hand stitched by our artisan seamstresses. The deep fibre print won't peel or deteriorate with washing. We then attach either the standard zipper or heart-shaped zipper. Everything is done by hand, and we ensure the print reproduction is a near photo finish. Machine wash at 30°c only and dry flat. Your custom cushion covers have a 5 year guarantee on print, material & stitching finish. Design your own cushion slips featuring your artwork all over, or choose a complementary colour for a two-tone style design. 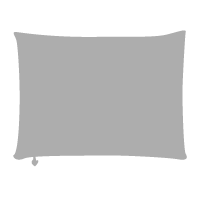 To ensure your end up with a nice, plump pillow cushion, adhere to the size guides above. The pad you need is slightly bigger than the slip so that you're not left with any empty areas and the printed cushion covers are filled out. Very Happy Great quality and service. The whole experience so far has been beyond expectations. Issues at first but soon sorted My first order so some printing issues. However, great customer service soon sorted to my satisfaction. Love the final product. 5 stars Fantastic quality, amazing colours and quick delivery. As ever a great buying experience. Outstanding reproduction! of design file sent! This is my first time, so I was uncertain as to how my design would be reproduced. On receiving the cushions I was so impressed at the printing quality! The design and colour matched the file sent. Well manufactured Excellent product, quality and service. colour quality This is a great service ,you are quick and the quality of the product is good. I think it must be my designs but the colour wasn't as good with the last order of cushions as it has been. Customer said 'exquisite' I ordered 2 matching 45 cm cushion covers for a customer of mine with subtle shades of similar colours and a highly contrasting yellow. All of which were printed beautifully. My customer was delighted with them! Custom cushion covers are perfect for giving your home a quick makeover. Keep your existing cushion pads and simply design new slips to complement your decor. Made from luscious Soft Velvet, use them as scatter cushions for the bed or get cosy with them on the couch. What's more you can design your own cushion slip on both sides, or choose from 5 colours for the reverse. These custom cushion covers can be printed with your hotel's logo and branding for a special touch in guest rooms. Not only decorative, this is a clever way to distinguish yourselves from competitors. For any establishment looking for a subtle refurb, printed cushion covers are a non-invasive way of adding new colour notes and texture details to the decor. The print reproduction on our Soft Velvet custom cushion covers is impeccable, so design your own using your artwork and watch your creations come to life. Give your customers the opportunity to decorate their home splashes of your art and style. Create different lines and mix it up with some cushion slips printed on both sides, and others with a plain colour reverse. Do I design the front and back? You design the front as standard and then select from 5 colours for the reverse, or choose to print your designs on both sides for maximum impact. Is this just the slip cover without padding? Yes, giving you the perfect opportunity to give your cushions a refresh. Simply use your existing cushion pads and replace the cover with these. Can I order a set? Certainly, and we offer a generous quantity discount when you buy more than one, and what's more, you can print different, unique designs. Be inspired by different interior design styles and browse our range of cushion covers created by #ContradoCreative artists. From floral and feminine to geometric and retro, there's something to suit every taste.